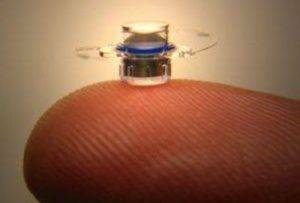 What Is CentraSight Implantable Miniature Telescope? Who Is A Suitable Candidate for CentraSite? This incredible device is leading the way in medical technology. It is the first implantable medical device for those suffering end stage macular degeneration. It provides people with the ability to see better and live a more independent life. The size of a pea, this telescope is implanted in your eye and magnifies what you see, sending those images to the area of your eye unaffected by AMD. The implant allows you to use your eye normally for both close and far vision. Average vision improvement of 3-4 lines on the eye chart. Minor 1 hour surgery. Clinical trials showed a significant increase in the quality of life for those with the telescopic implant. Partially covered by Medicare, FDA Approved. 12-16 weeks period of training and adjustment. The CentraSight Implantable Telescope is intended for people with end stage macular degeneration. This is where macular degeneration effects sight in both eyes, causing central vision loss in both eyes. End stage macular degeneration effects around 500,000 people, who may be eligible for the implant. Since macular degeneration only gets worse with time (it is a progressive disease), it is the leading cause of blindness in elderly. People with end stage macular degeneration. Meet the general health and age requirements. Have never had cataract surgery in the eye that will get the implant. Are no longer an eligible candidate for drug treatments for AMD.